A Kitchen rug completes the look of a beautiful kitchen. 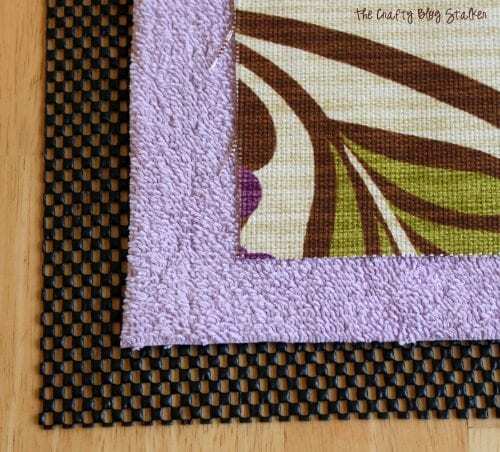 An easy DIY craft tutorial idea to make a custom kitchen rug. It’s easier than you may think! Do you like to make things for your home? There is something satisfying about seeing that beautiful thing you made, being put to good use. Recently I received a fun little package from JoAnn Fabric and Craft Store. My kitchen has been looking a little drab and I have been wanting to add something to give it a little bit of new style. That is when I decided to make some new kitchen rugs! The finished rug measures 17 x 27 inches. 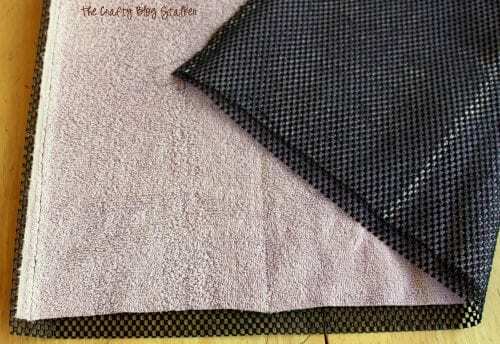 Begin by cutting the top layer of fabric to 29 x 19 inches, and both the towel and easy liner to 17 x 27 inches. 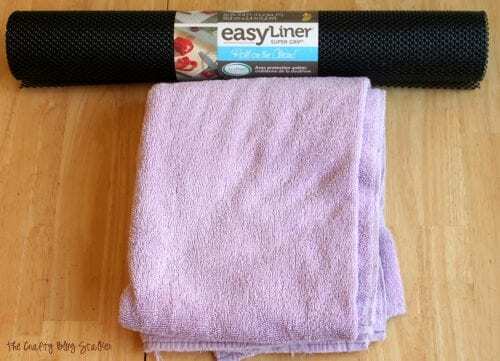 Sew the towel to the Easy Liner. Keep the layers as smooth as possible because you don’t want to feel wrinkles inside the rug when you are stepping on it. I sewed three lines to keep the Easy Liner and towel together. I sewed three lines throughout the rug to keep the Easy Liner and towel together. Serge around the edges of the top piece of fabric. If you don’t own a serger sew a hem around all four corners of the top piece of fabric. Place the top piece of fabric with the wrong side facing up on a table and center the towel and Easy Liner piece on top with the Easy Liner facing up. Fold the edges over and pin. 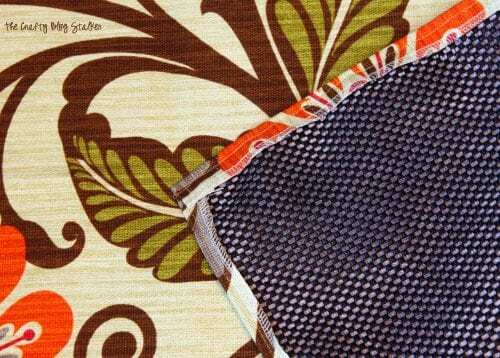 Sew around all 4 sides of the rug. Here is the underside. Not gorgeous but I am not worried about it because that is the side that most people won’t see. Now you have your own Custom Kitchen Rug that you can make to match any decor! To wash your custom rug, simply toss in the washing machine and lay flat or hang to dry. What is something handmade that is in your kitchen right now? Share and leave a comment below! 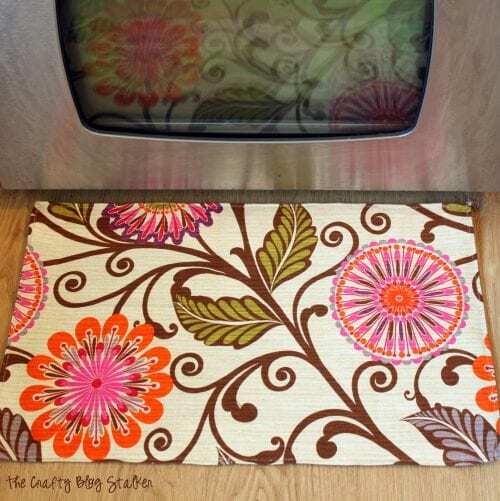 SAVE HOW TO MAKE A CUSTOM KITCHEN RUG TO YOUR FAVORITE DIY PINTEREST BOARD! This is so clever! 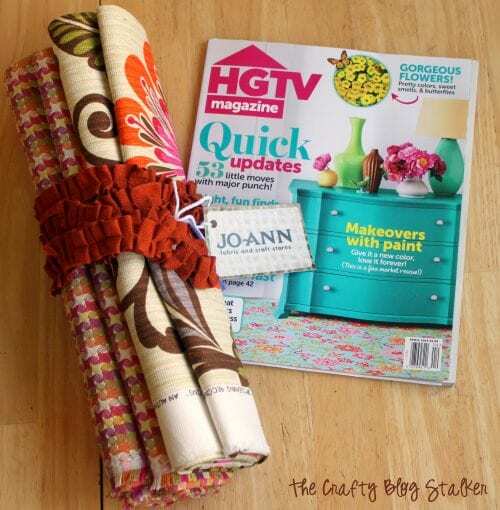 I love those HGTV fabrics! I never thought of making my own rug. Thanks for the inspiration! Pinned! Good Afternoon Katie, This is such a great idea. I need a new mat where I stand when I am washing-up and this would be perfect. I am going to hunt around my store of material and see what I can find. Like all of us who enjoy sewing there is always lots of pieces of material tucked away somewhere. I have enjoyed my visit Katie so I have become a new follower. I would like to invite you to visit me at Ivy, Phyllis and Me! you would be most welcome. Very cute rug! Found this link at Happy Hour Friday 🙂 I’ve been seeing quite a few crafts lately featuring this new HGTV Home Decor fabric line … is it machine washable? It is machine washable! Isn’t that great! Hi There,Great idea and easy to match up with any interior,even the bathroom!!! I love this! What a super idea! Pinning it! This looks so cool. I am really inspired to try it. Thank you for linking up to Get Crafty Friday! Hope you have a wonderful weekend! Love it! I pinned it and can’t wait to make one for my kitchen! Thanks! Really cute and a great idea! I hope this works because I’ve been having a hard time finding a rug that I like (that doesn’t cost a fortune!) Thanks for sharing. So clever! Am going to have to try this! Pinned it! Nice rug!! 🙂 I too thought of creating rugs from old towels, although not so systematic with liner and all. You have done it very nicely! Stopping by from HOHD party. Sweet project – thanks for sharing at Monday Funday! Your rug is gorgeous! I LOVE this fabric from Jo-Ann! What a great idea! Pinned it, hoping to make myself one soon! Thx for this post!! I’ve been wanting to do this and didn’t even think of the shelf liner stuff to put on back. Its off to the dollar store to get some!! I love this! So simple and so stinkin cute! Great idea! My hubby and I have a hard time choosing a good rug. I might just have to whip a couple up! I love making my own things from beautiful fabric. Great idea!! This fabric is so gorgeous, and what a fantastic idea! Thanks so much for sharing. Have a wonderful day! This is so great. I just made one of these (a rather long one) for a new puppy. Her doggie dishes were sliding all over the place on the slick linoleum floor. Now her dishes are staying put and she’s eating well. Thanks for sharing this great idea! I am new at crafts and sewing, so this may seem like a dumb question but you sewed with regular sewing machine or done by hand? Not a dumb question at all. All of the sewing was done with a sewing machine. I don’t have a kitchen rug because I keep saying I am going to make my own. Finally, a great idea for making one. Thanks for this great solution to my procrastination. This is perfect! I love this because you can actually get any design you want AND match it with other things around the kitchen! I love how this turned out! The rug is so cute and adds a great punch of color! I’ll be featuring this at the next Frugal Crafty Home Blog Hop tomorrow night! Thanks so much for linking up! Wow, I really love this idea. I wonder if spraying it with Scotch Guard in the beginning would help it stay clean longer. That is a great idea Lavonda. I am sure it would help. I’ll have to try next that next time. Wow! That’s a really cool idea! Pinning so I can make one soon. Thanks for sharing! 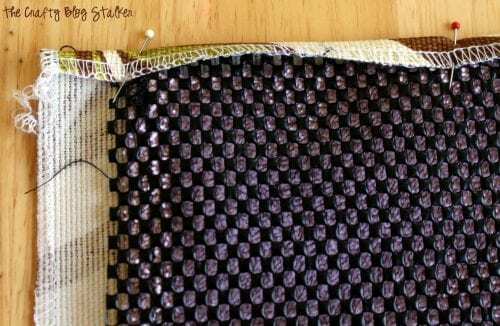 Do you think you could do this with fabric glue as well? I’m not really into sewing and don’t have a machine. Thanks, Cassie! I’m not sure how the fabric glue would hold up. But it is definitely worth a try! This project is adorable. I can’t wait for summer so I can have more time to craft! Thanks Pamela! This Kitchen Rug really was a lot of fun to make it turned out so much cuter than I thought it would. I love when that happens!! What a darling idea, Katie! I love that you can customize it to your décor or change it for the seasons. Thank you Megin!I am so glad that you like my Custom Kitchen Rug! Thank you, Charlene! It is a fun rug to make because you can make it match any decor or style! That’s such a great idea! The rug is beautiful! Thanks for sharing your tutorial at Sew It Cook It Craft It. Pinned. Thank you, Lina, I am so glad you like my custom kitchen rug. It was a fun project to make! Thanks for the feature Lina!